The Trump administration is often criticised for being hesitant to confront Russian President Vladimir Putin. The White House has frequently pushed back on that notion. Here’s what the Trump administration has actually done to confront Russian aggression. 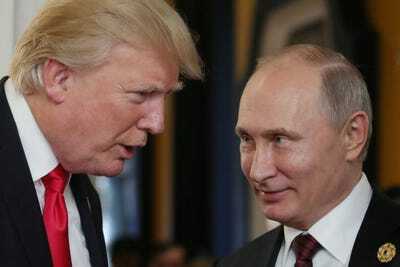 Despite President Donald Trump’s national-security advisers’ note reminding him “DO NOT CONGRATULATE” Russian President Vladimir Putin on his election victory during their call last Tuesday, Trump did anyway. When asked whether Trump thought Putin’s election victory was free and fair during a press briefing that day, White House Press Secretary Sarah Huckabee Sanders demurred. This argument has become a frequent line of defence Trump officials have used when pressed about the administration’s complicated relationship with Russia. Trump, whose response to the US intelligence community’s assessment that Russia meddled in the 2016 US election has been lukewarm at best, is often perceived as being hesitant to confront the Kremlin’s aggression. MIKHAIL KLIMENTYEV/AFP/Getty ImagesPresident Donald Trump chats with Russia’s President Vladimir Putin Danang, Vietnam on November 11, 2017. The Trump administration said it would expel 60 Russian diplomats in response to the poisoning of Russian spy Sergei Skripal in Britain. The measures were announced on Monday morning, and follow Britain accusing Vladimir Putin’s regime of being behind the attack. Moscow has denied involvement. The US move follows Britain’s decision to expel 23 diplomats working at Russia’s embassy in Britain in the immediate aftermath of the attack, which took place on March 4. On March 15, the Trump administration announced new sanctions on Russia for its attempts to interfere in the 2016 US election. The sanctions were scheduled to be implemented earlier this year, but Trump backed down, arguing that the sanctions bill he signed last August was already working as a deterrent against Russia. Trump originally signed the sanctions bill – officially called the Countering America’s Adversaries Through Sanctions Act – last August, albeit begrudgingly. The sanctions bill also imposes a wide range of sanctions on North Korea and Iran. After Congress approved Russia-related sanctions last summer, Russia expelled 755 American diplomats from the country. In response, the Trump administration ordered Russia to close three of its diplomatic facilities in the US, including its consulate in San Francisco, and two annexes in Washington, DC, and New York City. In December, Trump announced his support for the sale of lethal munitions to the Ukrainian government in its fight against Russian-backed separatists in the country’s Donbas region, a move that angered Russia, which has been engaged in a hybrid war in the region for the past four years. The State Department officially approved $US47 million weapons sale in early March. It included Javelin launchers and anti-tank missiles. On March 4, Russian dissident Sergei Skripal and his daughter, Yulia, suffered from a nerve agent attack. The father and daughter are living in London. The US, the UK, France, and Germany all blamed Russia for the attack. Although Trump initially failed to deliver a forceful condemnation of Russia for the attack, other officials in his administration picked up the slack. “Over the past four years, Russia has engaged in a campaign of coercion and violence, targeting anyone opposed to its attempted annexation,” State Department spokeswoman Heather Nauert said in a statement. Secretary of State Rex Tillerson said the attack “clearly came from Russia” and US Ambassador to the US Nikki Haley said the US stood in “absolute solidarity” with the UK after the attack. Trump then joined a statement with UK Prime Minister Theresa May, French President Emmanuel Macron, and German Chancellor Angela Merkel agreeing that there was “no plausible alternative explanation” than that Russia was to blame for the attack. State Department spokeswoman Heather Nauert and US Ambassador to the UN Nikki Haley have been particularly critical of Russia. On March 7, Nauert condemned Russia in a tweet, saying that it ignored a UN ceasefire agreement in Syria by bombing civilians in Damascus and Eastern Ghouta. “Your propaganda machine is out of control – you’re spamming all of us,” the MFA added. In January, Nauert condemned Russia for supporting separatists in the country of Georgia. Trump recently promoted her to undersecretary of state for public diplomacy and public affairs. Haley has also been critical of Russia over a variety of issues, including Moscow’s support for Bashar al-Assad’s regime in Syria and the Kremlin’s aggression in Ukraine.